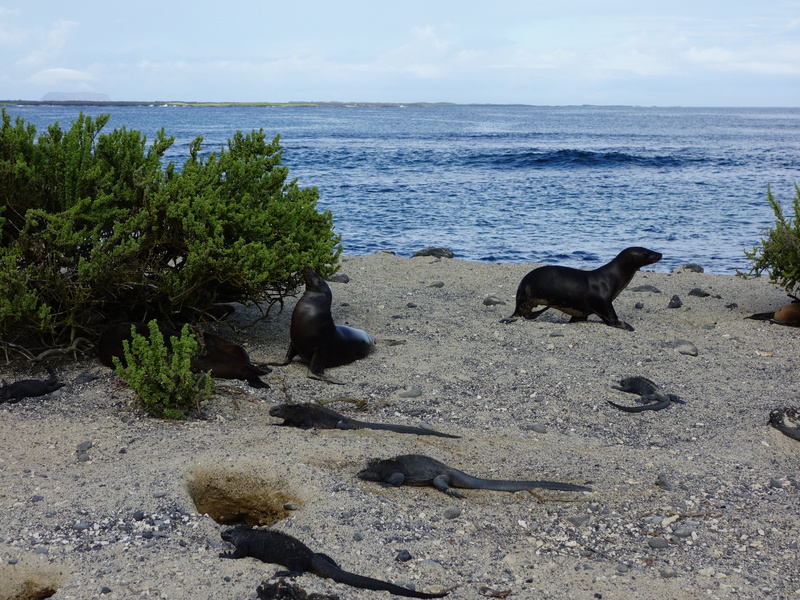 The Galápagos Islands have been the single best part of my trip so far. They were spectacular, as I hope the ridiculously photo-heavy next three posts will demonstrate. 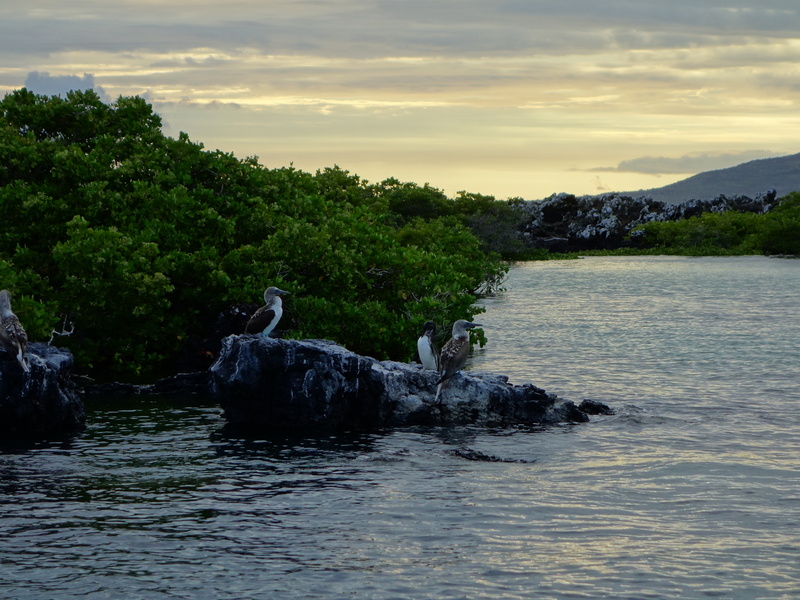 Of all the awesome places we’ve been over the last year so far, the Galápagos is the place I most look forward to going back to. And it’s the place I recommend to people – to everyone – the most. Even to those who have never heard of it. Perhaps especially to those who have never heard of it. It’s cheaper to visit than you might expect, too, given its reputation as one of those far-off exotic places that you only see when the BBC or National Geographic wants to win some more cinematography awards for one of their spectacular nature documentaries. Thank god once we’d got to South America and were planning our next few months, we figured out (in large part thanks to a few useful posts I found on the interwebs – thanks, helpful internet posters!) that it was actually much more accessible than we might have guessed. 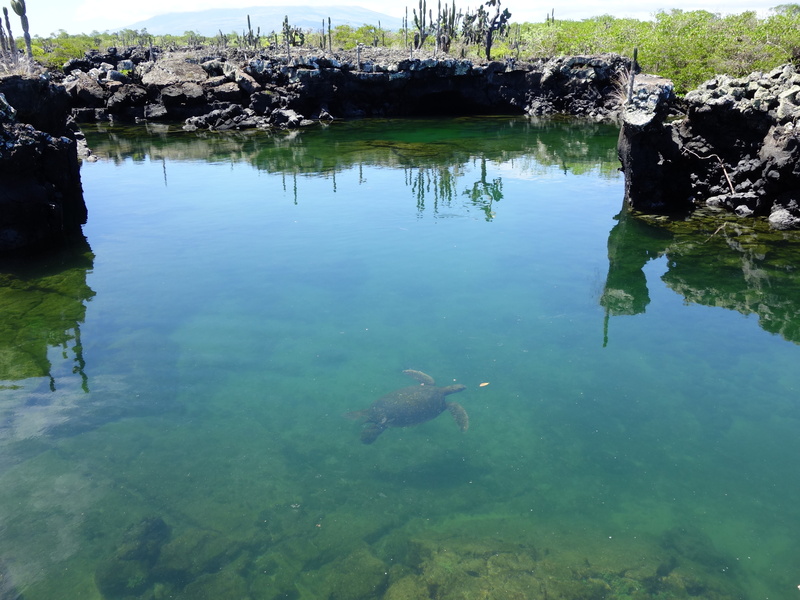 In the meantime, we had twelve incredible days in the Galápagos, spending a few days on each of the three inhabited islands (Isabela, Santa Cruz and San Cristóbal). Isabela is the most picturesque of the islands. It also has, right next to Puerto Villamil (the one and only town), the best beach we visited in the whole of South America. Throughout our time in South America, we got a lot of people (locals and other travellers) telling us how great various beaches were. Largely, you end up responding that, well, thanks for the advice, but we’re Australian. It takes a pretty damn good beach to beat the ones that we’re used to from back home. Puerto Villamil, though, has an Australian-quality beach. Long and wide, with beautiful fine yellow and white sand. 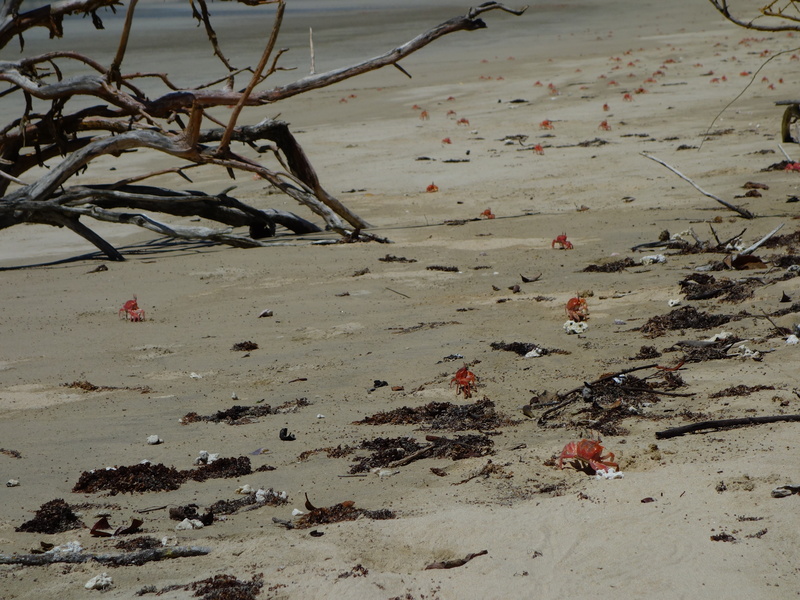 But that aside, there was another, perhaps more important reason it was the best beach we visited: it has an expansive inhabitation of ghost crabs, all busily scurrying away into their hidey-holes when you approach them. And I had a brand spanking new camera. 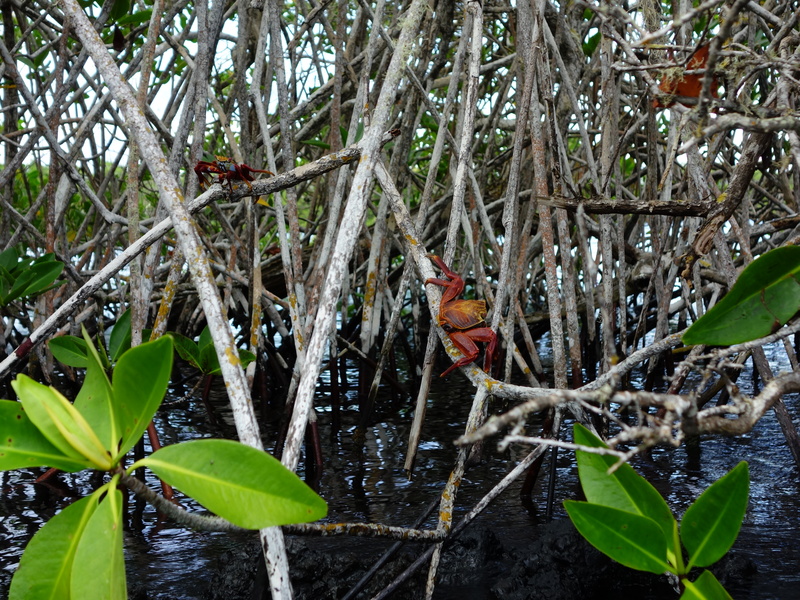 We spent maybe an hour chasing crabs and taking photos. Seriously, if you ever need any photos of ghost crabs, let me know. I have a good thirty or forty of them. And those are the ones I haven’t deleted yet. You can imagine that it was a spectacular experience. The sun was shining. The sea was blue. The fine white sand was blowing gently between my toes. The crabs were jumping in and out of their homes like some sort of environmentally-friendly (clubless) version of whack-a-mole. It was fantastic, and I spent the whole afternoon with a stupid grin plastered all over my face. Our purpose in walking along the beach had been to hike out to the Wall of Tears (El Muro de las Lágrimas) once we reached the sand’s end. 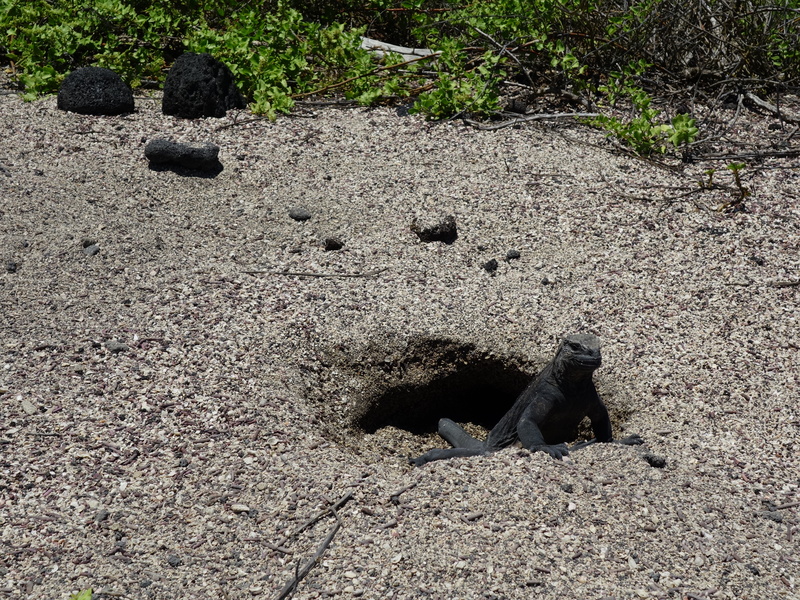 It turns out the path out there was closed, so we had to make do with the large colony of nesting marine iguanas at El Espero – the black volcanic rock outcropping at which the beach terminates. 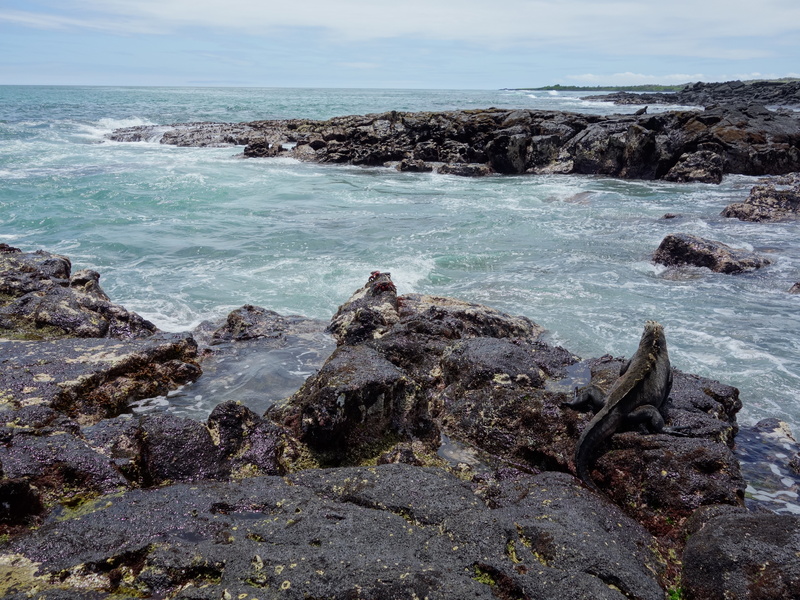 So we traded running around taking photos of ghost crabs on the sand for running around taking photos of marine iguanas and various other crabs on the rocks. Taking photos of the iguanas wasn’t hard, either. 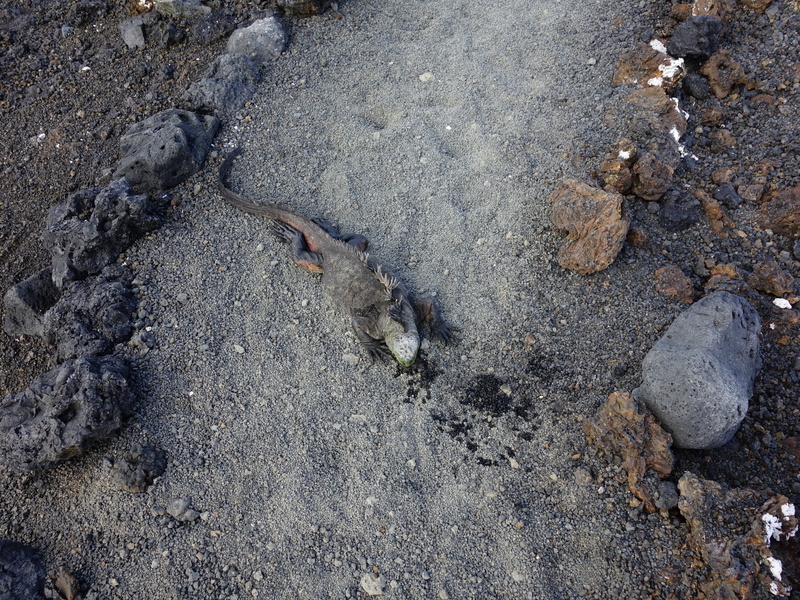 We were running around giddily, sure, but there was no actual chasing involved here: the iguanas are just everywhere. In fact, being a similar colour to the grey-black rock, they’re often there when you don’t even realise it. A couple of times I spotted Chris focussing his attention on how best to get the right angle for a photo of an iguana or crab he found interesting say five metres off, and I had to point out that by the way, was he aware that there was a massive iguana sitting nonchalantly right next to him, maybe an arm’s length away? After a leisurely stroll back in to town along the beach, we grabbed some snorkelling gear and headed to the port area for an afternoon dip at an area called Concha de Perla (‘Pearl Shell’). 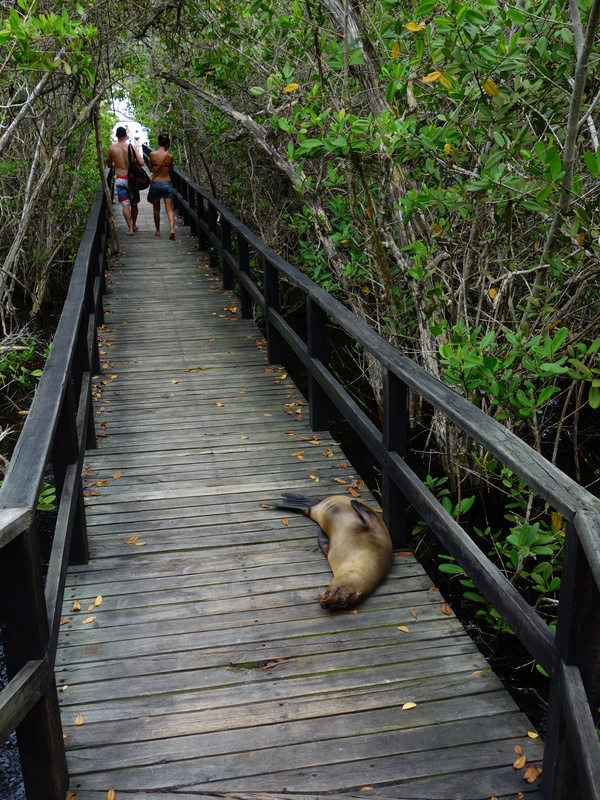 It was a fairly indicative introduction to swimming in the Galápagos: on the boardwalk through the mangroves, we had to walk around a sea lion which had chosen the walkway as an excellent spot to relax for the afternoon, and within minutes of getting in the water we swam pretty much right over the top of a large manta ray gliding majestically past not five metres out of reach. Day four was two organised tours with Carlos, the owner of our hotel. I say organised tours, but the tour group was just Chris, myself, and a Canadian couple who’d flown in the previous night. So still a fairly private experience surrounded by nature and not by a busload of noisy natterers with a forest of flashing DSLRs. 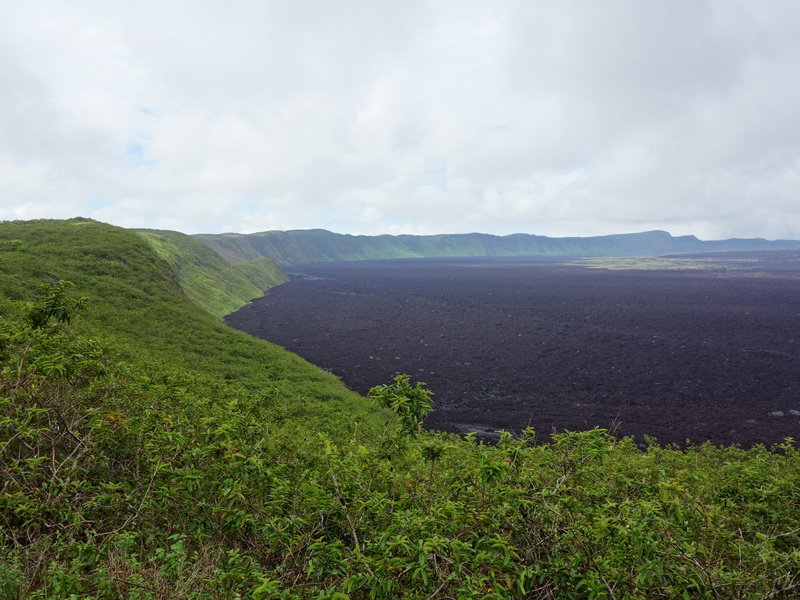 Our morning trip was up to two of Isabela’s five volcanos: Volcano Sierra Negra and Volcán Chico (the latter is a parasite volcano on the side of the former). Sierra Negra is one of the largest calderas in the world. (I’m sure Carlos told us it was the largest, but I’m quite certain Yellowstone is bigger, and we spent a while debating amongst ourselves whether Santorini looked bigger as well, so who knows by what criterion anyone’s making that claim.) Regardless, the volcano is still active – it last erupted in 1995, and there’s a lot of solidified lava flow around from that eruption, which is cool. And the walk up to and partially around its rim was quite pleasant. Carlos spent that time busily pointing out plenty of stultifying flora that I’m sure I would have found much more interesting if I were a botanist. But I also recall musing that if I were a botanist, I would probably be even less interesting myself. I guess there’s a trade-off. 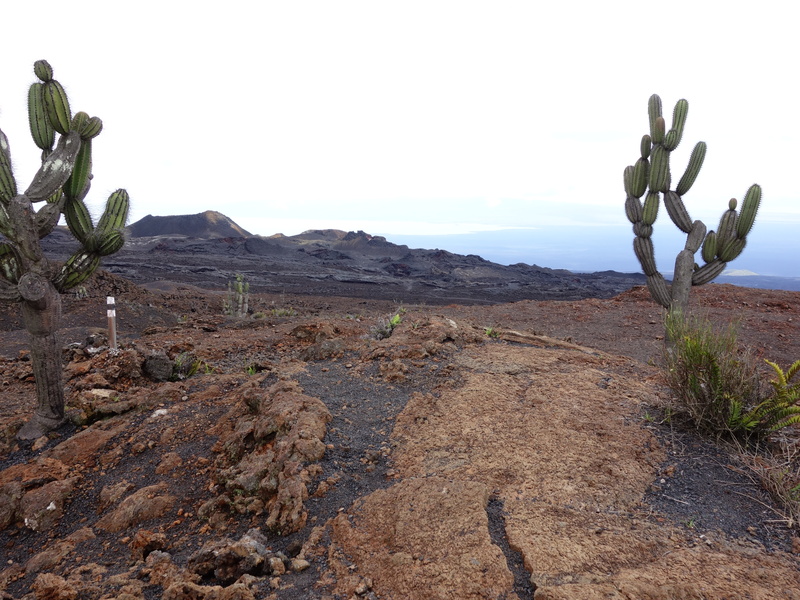 I was happy to make do admiring the volcanic landscape and enjoying the stroll. Once we got to Volcán Chico, that landscape suddenly became substantially more fascinating. Bleak and barren but for handfuls of cacti. A few holes in the volcanic rock, often filled with ferns. A nice view from the volcano’s sides out over the flatter areas of Isabela, too, and all the way out to Fernandina (one of the islands we unfortunately couldn’t get to – it’s only accessible on a week-long cruise). But really, as great a view as we had from the volcano, the dirt and rocks of the Mars-like landscape were not what we were in the Galápagos to see. 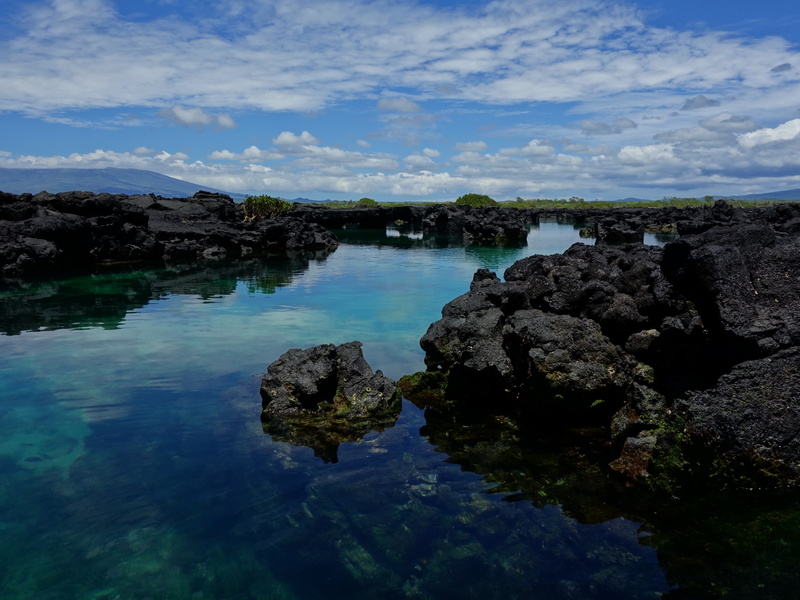 Back more towards the purpose of our visit, our afternoon activity was snorkelling at Las Tintoreras, a smallish group of tiny volcanic island outcrops near the port. 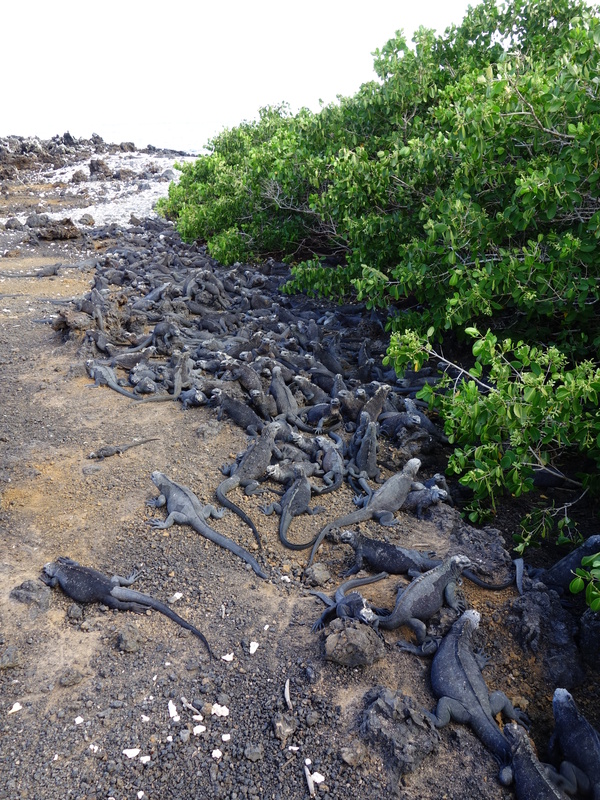 Before actually getting wet, we took a walk around the islets, which are home to a huge nesting colony of marine iguanas – literally thousands of them. 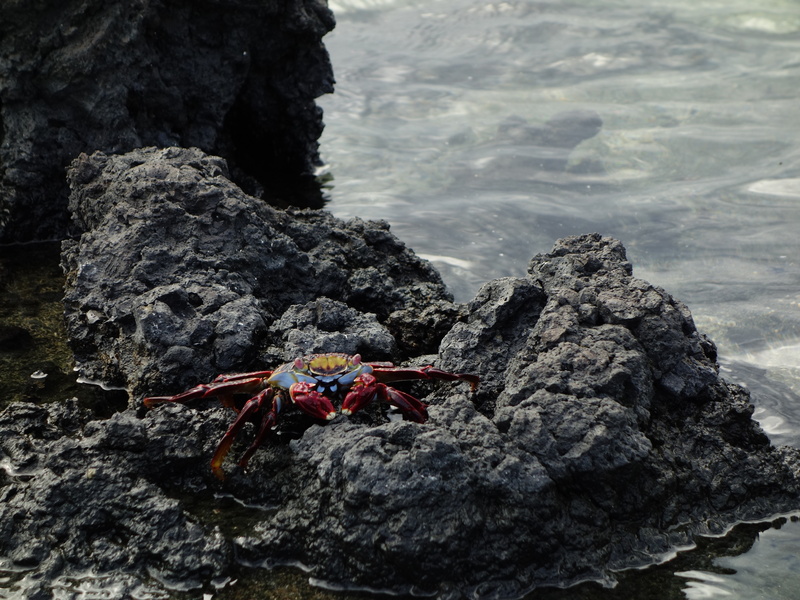 They’re home to just as many colourful crabs, too, as well as to a good handful or so of sea lions. There was a lot to photograph in a short period of time! And all that was before we got in the water. There were fish aplenty, too, some colourful, some not – in the latter category we saw plenty of pufferfish, though, so they were interesting even if not radiant. Then there were the two sting rays. I only saw one of them, but made up for missing the other by being chased by the one I did see for a bit, until I backed up enough to convince it that I wasn’t a threat. 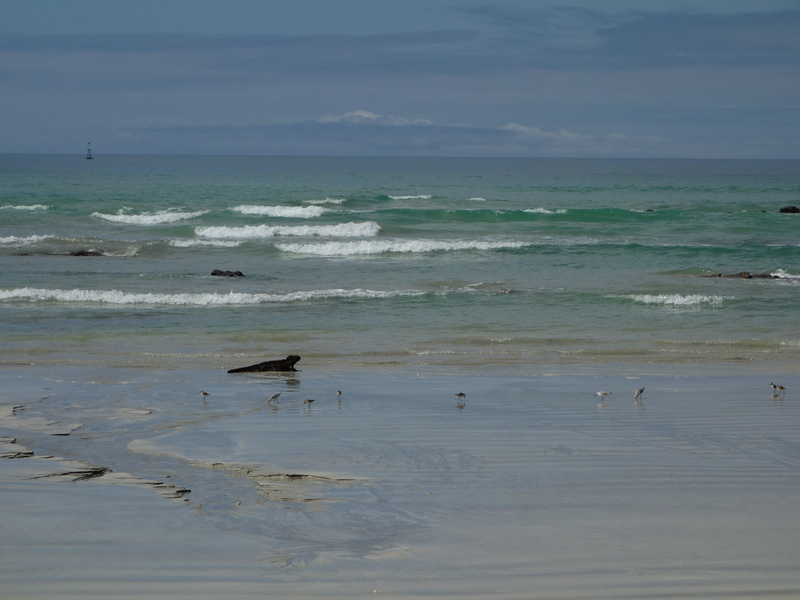 I didn’t see the white-tipped Galápagos shark that others did, either, unfortunately. Not to worry, there’d be other snorkelling opportunities over the next week or so! On the way back from Las Tintoreras as the sun starts to go down. Although you can’t really see it, that’s a penguin in the middle. Opportunities like the very next morning, for example – day five now – at Los Tuneles (‘The Tunnels’). 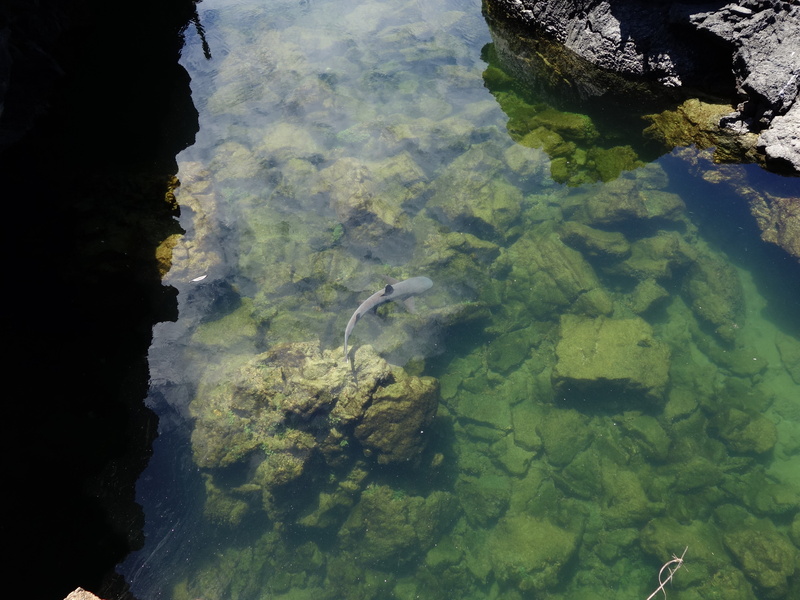 The tunnels are lava bridges formed when volcanic eruptions met the sea, creating under- and over-water swimthroughs near the shore. 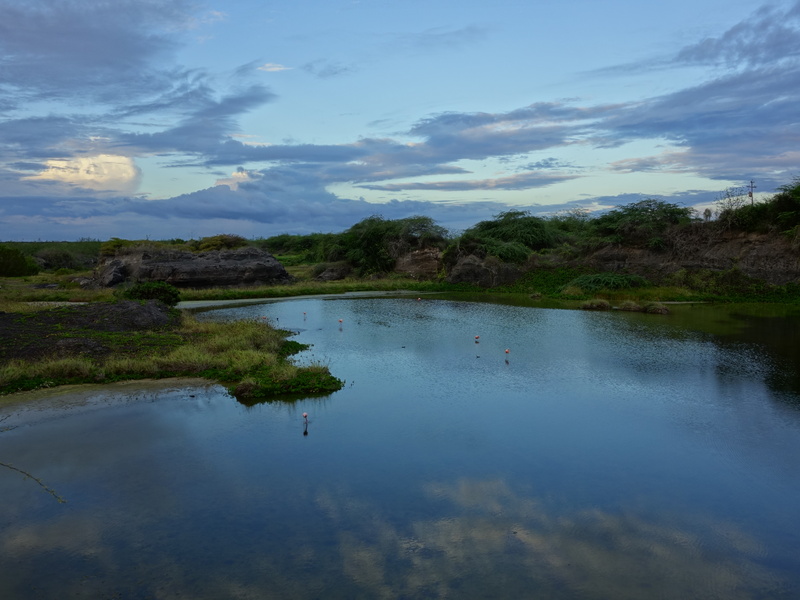 The result is a series of interconnected lagoons which are home to a wide variety of marine wildlife, amidst some of the clearest, calmest sea water you’ve ever seen. Initially our tour guide was wary of letting us go exploring – when he wasn’t literally towing the Italian woman who couldn’t swim (it was a bit weird – she kept accidentally rolling over, face up, snorkel down, which is not the ideal water-viewing and, y’know, air-breathing position), he seemed to be spending quite a lot of his time telling us to come back to the rest of the group. Much to our chagrin, since swimming with the rest of the group is a great way to see a whole lot of murky water full of kicked-up sand and seaweed, and not much non-human life. But eventually he realised that we were fine off on our own, and stopped objecting when we routinely adventured over yonder in the distance. And so we saw a lot more. We spent our time chasing sharks – Galápagos white-tipped and black-tipped sharks both – and swimming alongside sea turtles, as well as spotting a couple more rays, each about 50cm across, each nicely decorated in black with white polka dots, and each swimming happily around the various lagoons, largely oblivious to our presence. 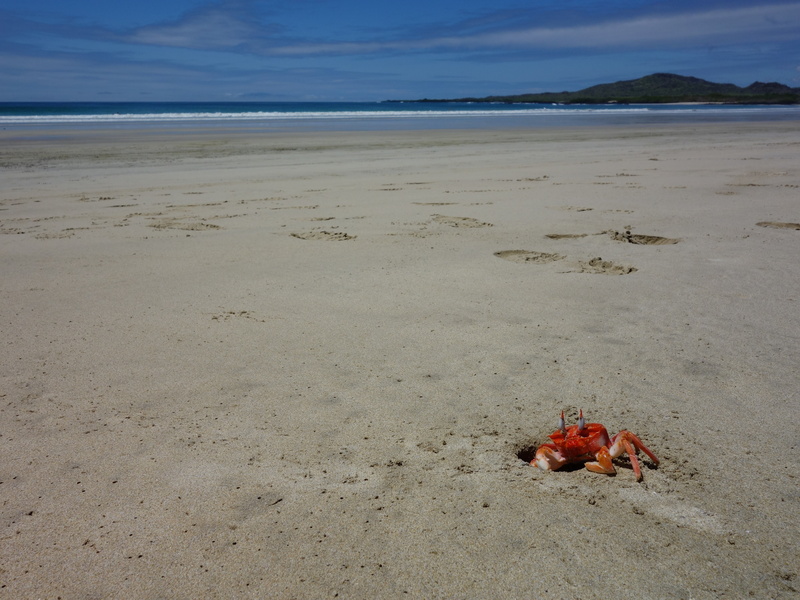 We found a quiet area with some tiny transparent shrimp, and at the second swim site of the day, Chris managed to find a bright red crayfish. Plus we were surrounded by the obligatory colourful parrot fish, a pufferfish or so, etc. You know, standard sort of stuff. There wasn’t really much more to it than that, I have to admit. Not that there needed to be! I managed a nice impressive (read bloody) cut on my heel when my overly-floaty flippers pulled my underly-in-the-right-place foot up into the ceiling of an underwater swimthrough, but I was bitterly disappointed to observe that the blood-letting wasn’t particularly effective in attracting more sharks for our viewing pleasure. So after our swim, we (well, I) spent much of our time on the boat trip back making juvenile jokes about boobies. And that was our stay on Isabela pretty much complete. 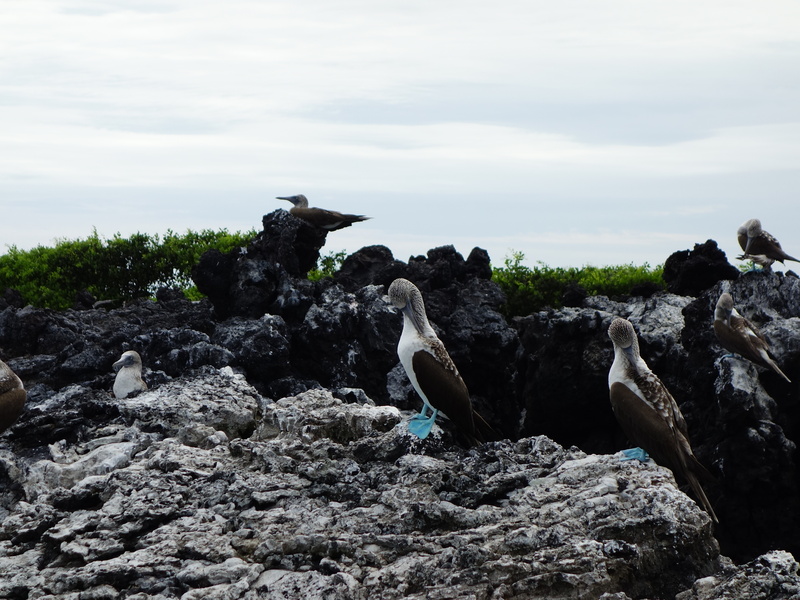 Blue-footed boobies. Best-named bird ever. 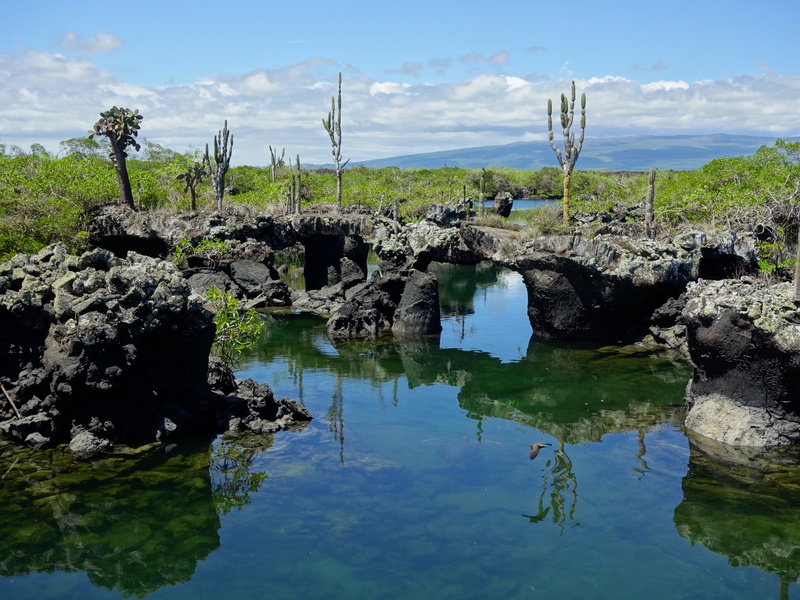 This entry was posted in Travel and tagged ecuador, galápagos islands, isabela by Sam Roberton. Bookmark the permalink.